Besides extracting and compressing archive files, Haozip has several useful functions, like checking an archive for errors and repairing damaged archives. It can even calculate MD5, Sha1 and CRC32 checksum for files. This can be useful to check the integrity of files. The main window of Haozip can also be used to browse your computer for archives you may wish to open or to create new archives. Haozip has a clean and user-friendly interface. The toolbar has all the basic functions you would need to extract an archive or create a new archive. You can open or create archives by double-clicking on the file or right-clicking on the files for more options. You can view images and read text files stored in archives directly from the application. It supports several image formats as shown below in the screenshot. You can also convert images to different formats. Just double-click on the text or image file to open it with the built-in viewer. You can also use a different viewer of your choice, to alter the settings check the option menu. 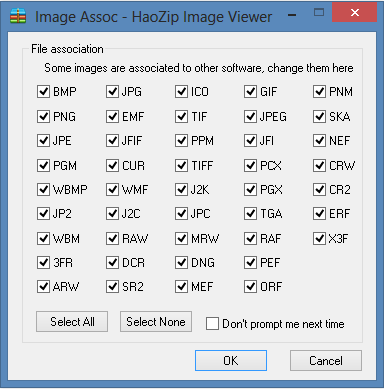 Haozip can compress files in three formats, 7z,ZIP and TAR. You can add a password to protect your archives. It even allows you to create Self-extracting archives and add comments to the archives you have created. This is useful in case you have to share some files via a cloud service like Dropbox or as an email attachment. 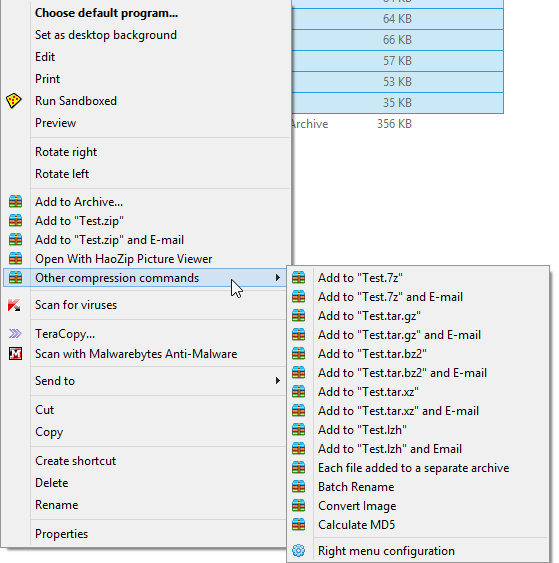 Haozip can be added to the Windows Explorer Context menu and has several useful commands for extracting files from an archive and creating a new archive. You can disable shell integration from the Options menu. You can download various skins for the Haozip Interface. Though the skin downloader shows the screenshots in Chinese, the downloaded skin supports English. In addition to this Haozip also comes with a Trojan Horse checking engine, I didn’t test this as it isn’t useful to me. You can also customize the appearance of the User interface by adding or removing toolbars and even change the font it uses. Can extract from many different archive formats. Can view images and read texts without extracting an archive. Virtual CD support adds some value. Only three compression formats are available. I tested it on my computer running Windows 8 Pro and it works fine. does it have any ads? From an old post @tipradar, one use mentioned abt ads. Probably they would have removed it now. I recommend Peazip. Why does not anyone review it. Far much better than HaoZip. Seems like a nimble free archiver. Peazip is far more powerfull.